The silver for sale from the Anonymous Mint tends to share important characteristics across all collections offered. The Anonymous Mint provides impressive attention to detail in its designs, offers most designs for just a limited time, and uses low mintage figures to boost collectible appeal. Right now, 1 oz Antique Silver Lisa Parker Collection Moon Gazer Rounds are available to purchase online at Silver.com. Rounds ship inside of protective capsules with a Certificate of Authenticity included with purchase! On the obverse side is the Moon Gazer design with a rabbit staring at the moon. The reverse face of the round has the Wild One design used for all rounds in the series. Designs selected by Julie Lindquist. Each of the 1 oz Antique Silver Lisa Parker Collection Moon Gazer Rounds in this product listing comes to you with its own protective plastic capsule and an individually numbered Certificate of Authenticity. The 1 oz Antique Rounds in this series are the lowest minted of the 1 oz silver rounds at just 250 rounds, a figure that matches all three versions of the 5 oz round in the collection. The antique polish applied to the rounds is a proprietary product that provides a distinctive visual appearance for the rounds. The antique polish gives each one a rougher, more rustic appearance that you might expect to find on ancient coinage. Silver rounds with an antique finish have a greater heirloom quality. 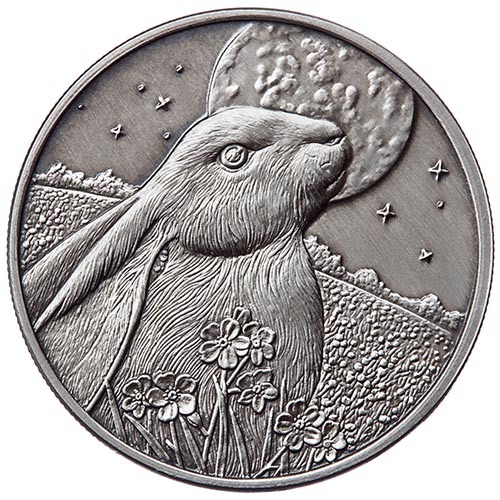 On the obverse side of 1 oz Antique Silver Lisa Parker Collection Moon Gazer Rounds is the design of a rabbit in a field as it stares at the moon. Known as Moon Gazer, the rabbit’s figure dominates most of the design element with the moon’s cratered surface featured high overhead in the design field. The background has a handful of twinkling stars that provide texture to an otherwise polished look for the sky. The reverse of 1 oz silver Lisa Parker Collection Moon Gazer Rounds includes the image of Wild One. 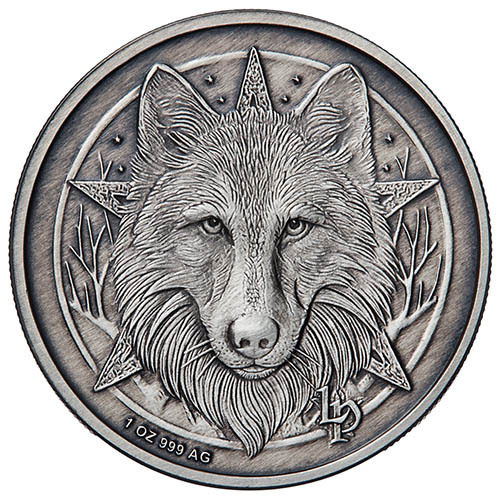 Among the most popular works from Lisa Parker, this design includes the front-facing appearance of a wolf’s head with a five-pointed star behind its figure. Anonymous Mint’s Julie Lindquist selected the six designs to feature in this series and Italian Master Sculptor Luigi Badia helped bring each one to life by hand-sculpting the designs onto dies to use in the production process.